Gerry M. submitted this photo and caption. Ten current and former students from Wakeland High School in Texas performed as members of World Class Drum Corps this summer. Here's a photo from the Friday night Semifinals with Lucas Oil Stadium as our backdrop. 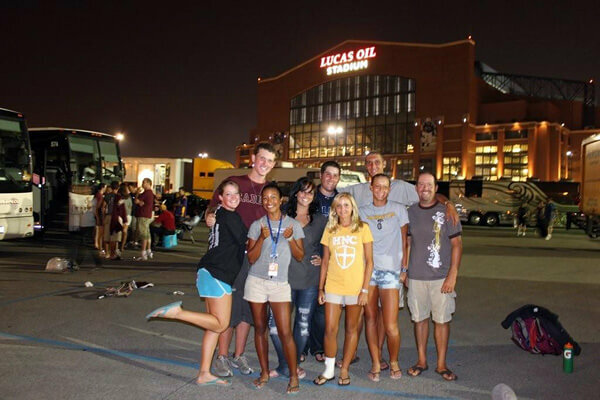 Left to right: Andi (front ensemble, Blue Knights); Matt (contra, The Cadets); Kate (drum major, The Cadets); Danielle (guard, Pioneer); Sean (baritone, Blue Stars); Taylor (mellophone, The Cadets); Allison (mellophone, The Cadets); Michael (bass drum, Blue Stars); band director Gerry M. (staff, The Cadets); Tanner (baritone, The Cadets - not pictured); Ryan (front ensemble, The Cadets - not pictured). It was a great summer filled with many wonderful memories.